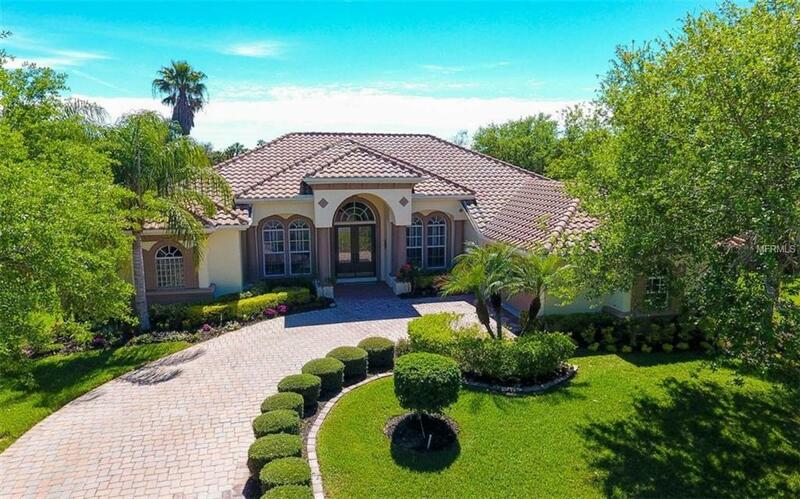 The recent opening of the Ft. Hamer Bridge puts this idyllic home minutes away from Lakewood Ranch, Sarasota and the amazing Gulf Coast beaches. Located in Savannah Lakes, a golf and boating community with low HOA dues, no CDD fees and OPTIONAL Club Membership. This home is one of only 5 that look over a large lake connected to the Manatee River (no flood insurance required) surrounded by preserve affording a lot of privacy, abundant wildlife and amazing sunsets every evening. The home has been maintained meticulously. It has 4 bedrooms PLUS an office with abundant built-ins and granite tops. The owners recently installed beautiful marble tile with custom inlays throughout the main living areas and bamboo floors in the Master Bedroom, Office and one secondary bedroom. The huge kitchen features stunning translucent granite countertops. It has a large lanai and a tropical pool with both a fountain and a waterfall and huge outdoor kitchen island. The Golf Cart Garage is one of the largest you will find, making this garage functionally equivalent to a 3-car garage. Amenities Additional Fees River Wilderness Golf & Country Club Membership Optional Fitness Center Social Events Dining Golf Boat / Rv Storage Tennis Pickle Ball Community Pool Personal Trainer Massage Services.